Most of the fonts are in the public domain however may have attached conditions of use. You are therefore strongly encouraged to read any information contained in the zip files, to ensure compliance with conditions of use. Angelic or Celestial Script - This script is based on the Hebrew alphabet. It is not case specific. Capital S gives Shen, and lower-case gives Samech. Capital T gives Theth, and lower-case gives Tau. All other letters, capital and lower-case give same letter. Theban or Honorian Script - A Magical alphabet. Malachim Script - Based on the Hebrew alphabet. A collection of scripts some mentioned above. These include: Celestial, Malachim, Passing the Rivers and AIQ BKR Cipher. Occult Symbols - A range of Occult Symbols you can add to your computers Font file. The Hebrew Font - Ensure you can read document which require the Hebrew Font. The Coptic Script - Antonious Bold This Coptic font was downloaded fromSt. Takla Haymanot Church Web Site. The Coptic Script - Antonious Normal - This Coptic font was downloaded for St. Takla Haymanot Church Web Site. Coptic Script - Amother version. Passing the Rivers - The Passing the River or Passage du Fleuve alphabet is believed to be derived from the Hebrew alphabet. Originally publishes by Heinrich Cornelius Agrippa during the 16th Century. Apollonian - The Apollonian font is a Greek-based late-mediæval secret alphabet attributed to Apollonius of Tyana. 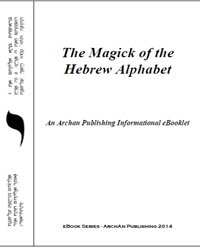 The aim of this eBbooklet is to help all students who want to learn how to draw, and recognize the Hebrew letters and also to understand their inherent magickal power, which may be used by us all, that is if we know how. It this work I will show you how!. The Western Magickal Tradition has consolidated many diverse strands of thought and symbolism. However one of the greatest contributors to the tradition is the Judaic traditions which are the basic cornerstones of medieval magickal knowledge. It is not only the study of the Kabbalah, that requires some knowledge of the Hebrew alphabet and preferably of Hebrew itself, but also those that wish to practice talismanic magick. For those that take the challenge of studying the Hebrew alphabet and its power, their efforts will be rewarded tenfold. The reader does not require any prior magical training or knowledge, however it is also suitable for the advance practitioner wishing an introduction to the Magic of the Angels of Men (Pauline Art). Anyone who has studied the Magickal Arts will be familiar with some or all of the Alphabets or Scripts contained in the book. Probably the most commonly used Magickal Script is the Theban Script of which you will learn more of later. Working on many Scripts requires added care and concentration, which means added Magickal force to your rituals and invocations, but the same also, applies to the spoken word.Â Ancient religions made their prayers (or invocations) in other languages than the one they used for daily life, because it means that the orator needs to think carefully, and this mental concentration adds force, to their prayers or invocations.Â But sometimes, when we want to pray quietly, a written invocation is better.Â At other times we feel the need of words, for words have power. 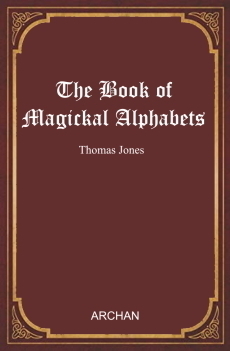 This book cover all the main Magickal Alphabets or Scripts with simple spells to which the scripts can be used for. There is also a chapter on how to make your own talismans, Sigils and amulets. How to magickal consecrate your talismans and much much more. Keep coming back we intend to list all the font sets as indicated in our article on Magical Alphabets. Click here to read it. As far as we can establish all these fonts are in the Public Domain. If you have information to the otherwise please let Archangels & Angels know and we will remove the link.